Wheathampstead House was built in the 1840s and was home to Field Marshal the 10th Earl of Cavan (1865-1946) who fought in the Second Boer War and the First World War. He led the Italian 10th Army at the Battle of Vitoria Veneto in 1918, which secured the dissolution of the Austro-Hungarian Empire. Famous visitors included Dame Nellie Melba, the Australian opera singer. 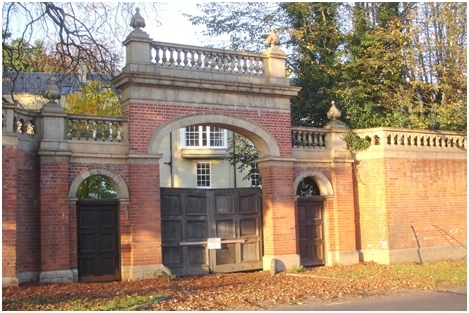 The impressive wall and gateway were added shortly after the railway arrived to screen the house from Wheathampstead Station. The wall is built of red brick with terracotta moulded coping and ornamental balustrades. It is about five metres high and 50 metres long. The wooden gates, each with six panels, are original. The house, which was used as offices for many years, is now a preparatory school for St Albans High School for Girls.